Israel prevents Palestinians from playing football. 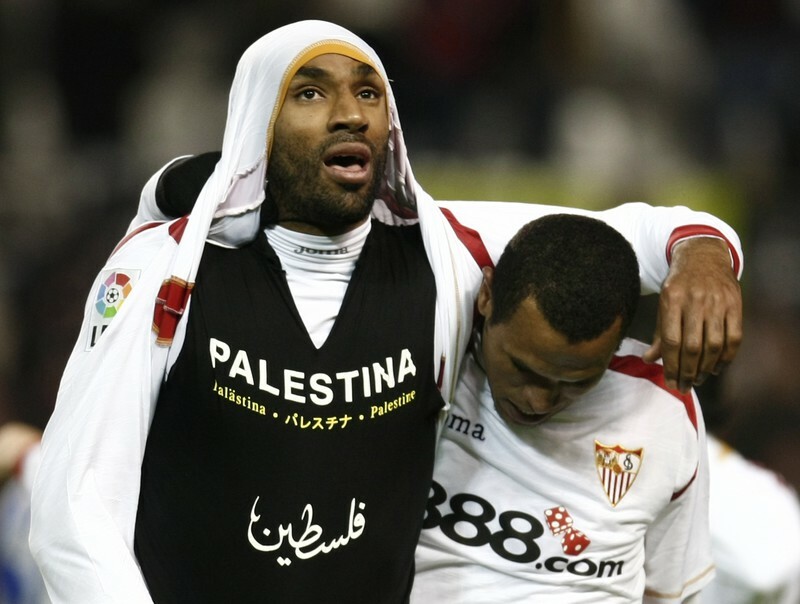 Palestinian players are routinely attacked, imprisoned and killed. Players are denied freedom of movement to attend their own matches. Palestinian stadiums have been bombed and destroyed. 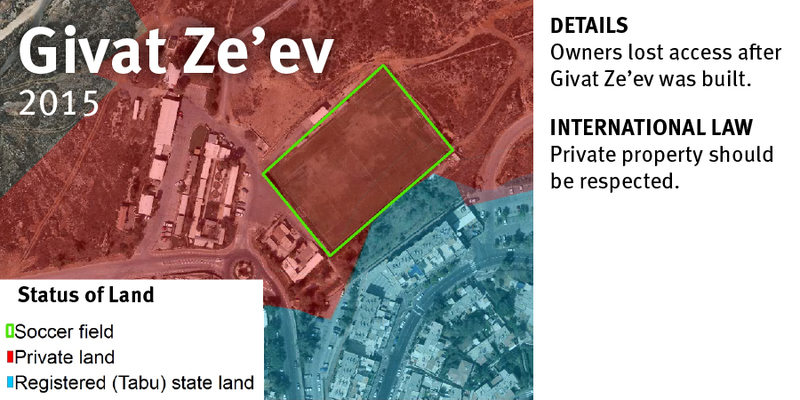 Israel even prevents football equipment from being imported and football facilities from being developed. Racism against Palestinians is institutionalised in Israeli football. From segregated youth football leagues to anti-Palestinian hate from fan clubs that goes routinely unpunished. In addition, seven Israeli clubs based in illegal settlements are allowed to play in the official league of the Israel Football Association (IFA) making FIFA - the football governing body - complicit with violations of international law. But FIFA has looked the other way, refusing to take action. This campaign seeks to suspend Israel from FIFA and other international forums until it ends its attacks against Palestinian football. Israel deliberately destroys Palestinian football stadiums and detains Palestinian players. It restricts their freedom of movement, banning Palestinian athletes in the occupied West Bank from training with their counterparts in the Gaza Strip, and subjecting them to interrogations at checkpoints when traveling across the West Bank or abroad to take part in international competitions. Israeli forces have in the past targeted the feet of teenage Palestinian footballers with live ammunition. Meanwhile, Israel allows seven teams based in its illegal settlements to play in the Israel Football Association (IFA), its national league. FIFA, the governing body of world football, has failed to take action against the Israel Football Association for its inclusion of these teams based on illegally occupied land. By failing to act, FIFA is allowing Israel to use “the beautiful game” to whitewash its forced displacement of Palestinians and is in violation of its own rules, which forbid member associations from playing in the territory of another member association without the latter’s permission. Just as FIFA, refused to recognize Northern Cyprus’ and Crimea’s football associations for similar reasons, it must now be consistent with its own guidelines regarding the IFA. 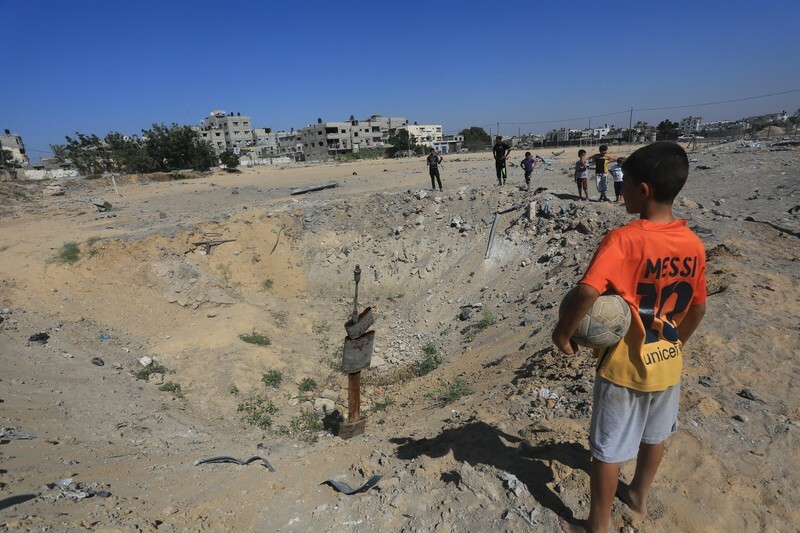 Palestinians have long complained to FIFA about Israeli attacks against Palestinian players, including arrest and torture and denial of movement permits, and the bombing of football stadiums in addition to routine disruptions of the import of football equipment. Israel’s illegal Wall, colonial settlements, as well as its policy of siege, curfew and military roadblocks have systematically obstructed the practice of sports by Palestinians and denied Palestinian athletes regular training and participation in matches and tournaments, at home and abroad. Moreover, Israel consistently prevents Palestinian athletic teams from traveling and denies entry of international athletes into the occupied Palestinian territory. During the 22-day assault on Gaza in 2008-2009, three members of the Palestinian national football team were killed by Israeli forces and Israel has routinely arrested Palestinian players before games. Additionally, in 2012, Israel demolished a community center in Silwan which served two football groups and 300 children. Furthermore, Palestinian football players have been forced to end their sports careers after being shot by Israeli forces in the legs. Israeli football teams enact racist policies toward Palestinians. The Israel Football Association has failed to address and sanction the teams for tolerating and perpetuating these behaviors. Below are few examples of these discriminatory strategies. The team’s fans have habitually attacked Palestinians and were witnessed chanting “death to Arabs” at matches against Palestinian teams. 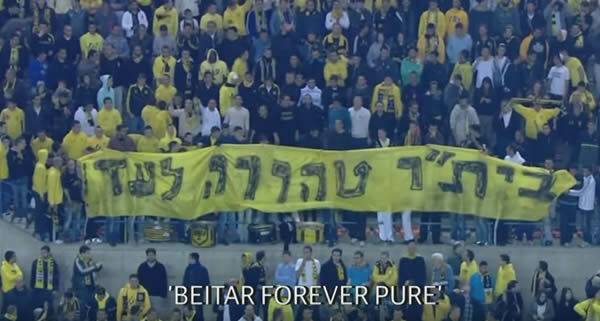 Amit Ben Shushan, football player with Beitar Jerusalem,, also sang with the audience "I hate Arabs" when they won the Israeli Cup in 2009. The Israel Football Association (IFA) runs segregated youth leagues based on national origin, keeping Palestinian and Israeli youth from playing together. While Israel deliberately destroys Palestinian football stadiums and detains Palestinian players, it allows seven teams based in illegal settlements to play in its national league. Israeli settlements are illegal under international humanitarian law. The UN special adviser on sport for development and peace, 66 members of European Parliament, 30 members of Swiss Parliament, more than 40 members of Danish Parliament, 38 members of the British House of Commons, civil society organisations, football fans as well as Human Rights Watch have all urged FIFA to resolve the issue of settlement clubs. An April 2016 report, commissioned by FIFA and written by John Ruggie, makes recommendations for FIFA to implement the UNGP throughout its activities, outlining the human rights responsibilities of businesses. 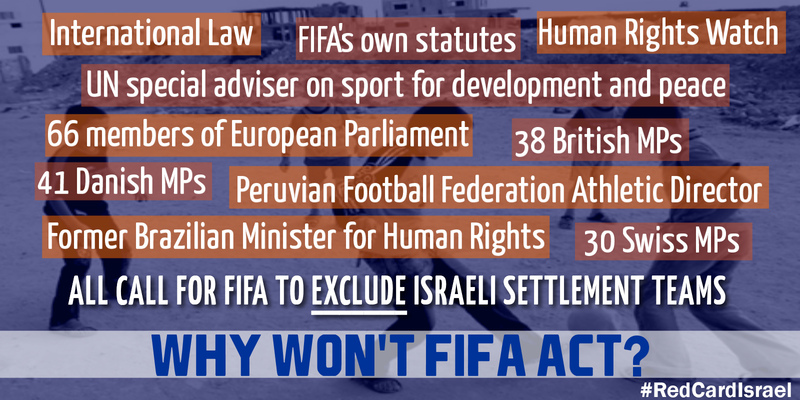 This includes the exclusion of Israeli settlement teams or the suspension of the IFA from FIFA. UN officials, lawmakers, footballers, cultural icons, international human rights organizations and grassroots movements have all called for world football to sanction Israel for its widespread violations of Palestinian rights. 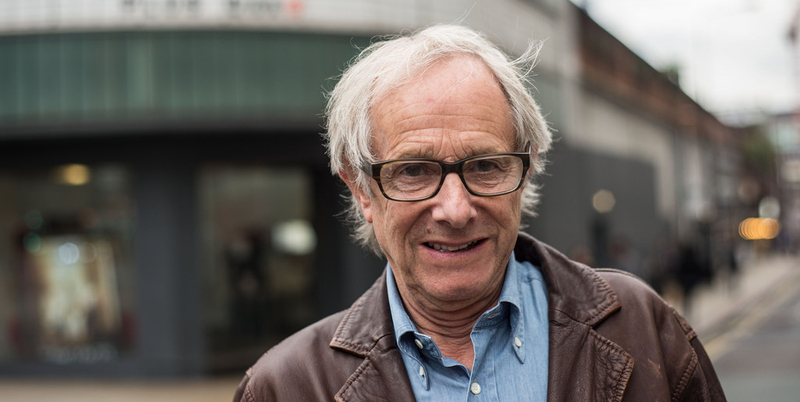 Notable figures, including Ken Loach, Bob Russell, Ahdaf Soueif and the late John Berger have already written an open letter calling on FIFA to suspend the IFA. In the larger sports boycott, in 2012 footballers condemned plans for Israel to host the UEFA Under 21 Championship in Israel, and Norwegian National team coach, Egil Olsen has supported the academic and cultural boycott of Israel. 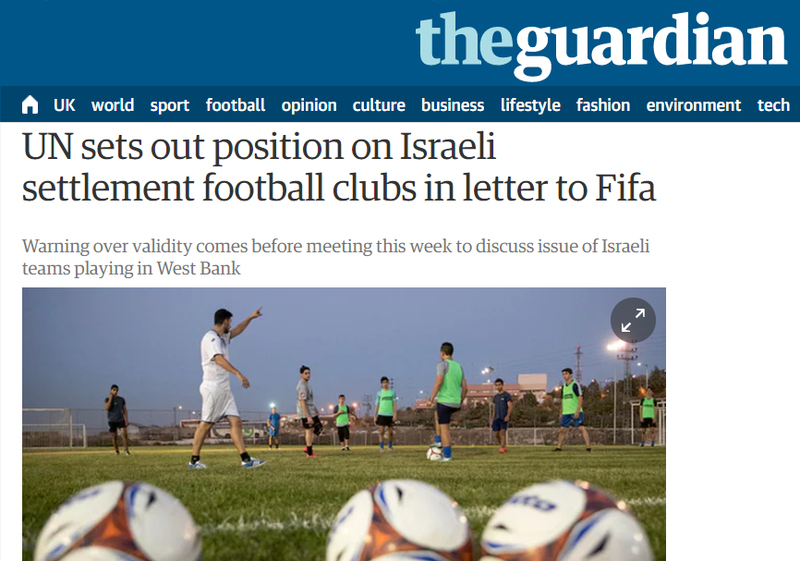 Organizations representing millions urged FIFA to expel Israeli clubs in settlements. Israel uses sports and the beautiful game in its efforts to improve its image while violating the rights of Palestinian athletes. Grassroots campaigning can raise awareness on the conditions of Palestinian sports among football fans and put pressure on world football to hold Israel to account. Palestinian civil society organizations and sports associations are calling for a boycott of Israeli football until it respects Palestinian rights. Help us spread the word! There are organisations working on football boycotts across the world. Get active and connect with a group in your country now! 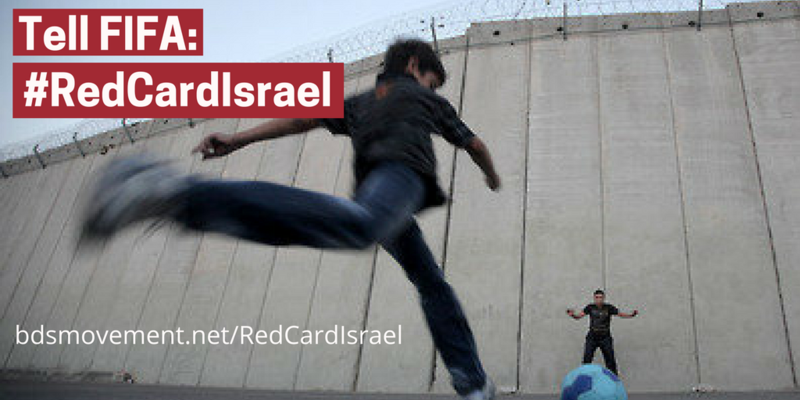 Join the #AdidasPlayFair campaign by sign the petition urging the German sportswear giant to end its sponsorship of the Israel Football Association due to the IFA's inclusion of teams based in illegal Israeli settlements built on stolen Palestinian land. Adidas cares a lot about their brand - because if their brand is hurt their business is hurt. Let's show Adidas that their loyal customers around the world will stop trusting and buying their products if they don't end their complicity in human rights violations. Urge your country’s national football association and footballers to uphold international law and FIFA statutes. Help gather signatories from the world of football to pledge a boycott of friendly matches with Israel and Israeli clubs, sending a message that there is no ‘business as usual’ for as long as Israel continues to attack Palestinian football. For more information on how to join this ongoing effort please contact PACBI. Campaign for local football and sports associations to support their Palestinian colleagues. Raise awareness on the conditions of Palestinian athletes and sports among local sports teams and fan clubs.